I have always nursed a deep and abiding love of letters. There’s something so much more personal about a handwritten note than the digital coldness of an email. Nowadays it really does take an extra effort to use the post, but doesn’t that just make it more special? To whit, I saw this incredible leather shoe postcard over at I Swan. Do you think USPS would accept something like this today? It is perfection. The perpetually impressive ladies over at Design Sponge recently posted an amazing Ikat fabric DIY. A few months ago we inherited a sturdy chair that belonged to Jacob’s grandfather. I’m scheming to replace the old (appallingly) upholstered cushion with this in the not too distant future. This beautiful moss ring by Sylwia Calus Design takes the idea of a green thumb to new heights. If you’ve been following this blog for half a second, you’ve probably realized I am braid-obsessed. It comes as no surprise then, that I am in love with these tousled, deconstructed, beachy plaits sported in Free People’s June catalog. Thanks to some backstage cameras at the shoot, you can see how to get the look yourself! Although I must say, you would likely get the same result with much less effort after sleeping in your braids. Jacob and I have been wistfully dreaming of a vacation of late. Something off the beaten path. Something a bit unusual. 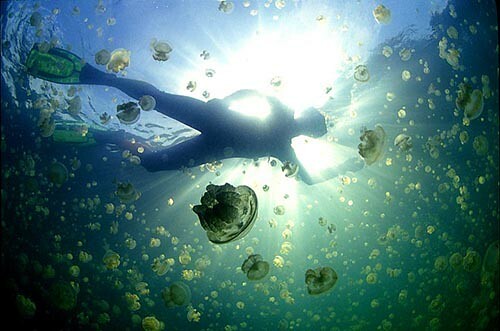 Jellyfish Lake in Palau is a definite contender in my book. Then I might have to refer to Jacob as Jellyman for all eternity. Have a wonderful week my dears!